Whether you’re interested in beginners to rigorous yoga, The Zen Dragonfly, HealGlow, and GodBody Creations offers a variety of classes for all levels on the 2nd floor of the Walnut Way Center. 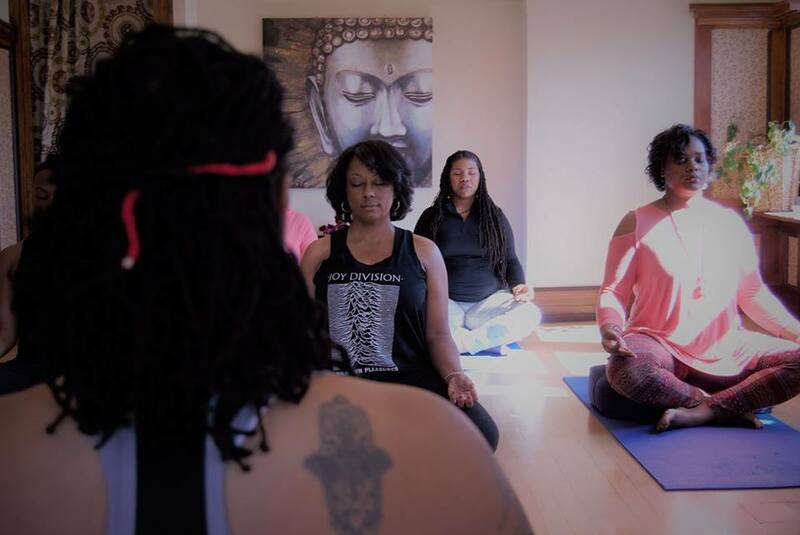 Walnut Way rents space to wellness businesses to offer Yoga and dance classes. This is our next step forward to revitalize the Lindsay Heights neighborhood, to improve individual health and strengthen a culture of wellness. We support local business owners as they grow their practice and increase access to movement & yoga classes in Lindsay Heights. Description: Sound journey for healing and relaxation. Participants will drum, and do journey work for healing through sound using small percussion instruments and drums. Sharing time to share their experiences and journal the healing that is taking place. Description of Candlelit Yin Yoga: Unwind the day with a relaxing yin yoga flow. Yin Yoga is a meditative approach to yoga in which we hold gentle asanas (poses) for longer periods of time, bringing calmness to the mind and elasticity to the body (Beginner). Description of Hatha Yoga: Hatha yoga is one of the oldest practices of yoga. This flow is centered around alignment of the spine, bringing strength and balance to the body (Intermediate). Description: Sundays are devoted to self care, self reflection, and self preservation. Join H+G for a calming and rejuvenating Yoga session every 3rd Sunday of the month.This 60 minute practice will incorporate a challenging yet soothing Vinyasa flow developed to unite balance, deep stretching, as well as breath and body awareness. Description: Sowful Yoga and Dance is a combination of all things healing! It’s a sensory session in sound, movement, joy and most of all FREEDOM! It is dancing your way, the way the music moves you. It’s stillness and awareness in your body. It is fun, yet sacred, and a non-judging space for all levels. Chairs are proved for those who may have some limits in their bodies now. It is an hour of freedom like no other. It is your space of exploration, sweat, laughter, and heart. It releases stress, anxiety, and elevates your joy. Yes, it is a workout and your body will gently whisper “thank you” at the end. *At the time of check out add the 9 class package plus the Feb. 7th class to receive the pricing of $60. You save $20 for 10 classes! What’s coming in 2019: Phase II of The Innovations and Wellness Commons, our two-phase development project on 16th and North Avenue will welcome wellness instructors and serve as a collaborative community center, with wellness programs, a rooftop terrace, and a neighborhood yoga studio. Heal + Glow is at the Intersection of Wellness, Art + Culture. Sign up for classes and shop products at www.healglow.com. If you are interested in renting space at Walnut Way, contact Angela Smith, Holistic Health Coach at amsmith@walnutway.org for more information.